Governor Palin appeared briefly on the “Glenn Beck Show” today, via video. 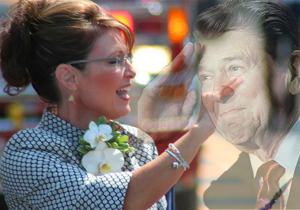 As my Conservatives4Palin comrade, Sinistar, pointed out earlier, she certainly doesn’t appear to be the person Mr. Gross depicted in his Vanity Fair hit piece. Yesterday, Kelsey relayed the story of how Viet Nam vet, Dave Roever was interviewed on the Glenn Beck show and how the Palins hearing that Mr. Roever was in need of a television studio offered the use of theirs. In addition to the generosity of opening their home, Governor Palin rejected the talk of Mr. Roever getting a makeup artist out there to prep him for taping and offered to do it herself. Quite a different image of her than what you might think if you got all your news from Vanity Fair, huh? I’ve been trying to convince my fellow conservatives that they have been wasting their time in a fruitless quest for a new Ronald Reagan to emerge and lead our party and our nation. I insisted that we’d never see his like again because he was one of a kind (Reagan, 2008, ¶1). I was wrong (Reagan, 2008, ¶2)! “Wednesday night I watched the Republican National Convention on television and there, before my very eyes, I saw my Dad reborn; only this time he’s a she (Reagan, 2008, ¶3). And what a she (Reagan, 2008, ¶4)! In one blockbuster of a speech, Alaska Gov. Sarah Palin resurrected my Dad’s indomitable spirit and sent it soaring above the convention center, shooting shock waves through the cynical media’s assigned spaces and electrifying the huge audience with the kind of inspiring rhetoric we haven’t heard since my Dad left the scene (Reagan, 2008, ¶5). Two years ago today at the twenty second hour and the thirtieth minute Eastern Daylight Time, our yearning for a great leader to bring the Republican Party back home to its basic principles was answered. Someone at the GOP knew this, for Governor Sarah Palin had a countdown timer running throughout the RNC convention until her speech began. The Presidential candidate did not, but he may have realized win or lose that she was his final gift and final act of sacrifice for our nation. Since that time, Governor Palin accomplished at the conclusion of her term what 50 years of successive administrations in other states could only dream of. Her brainchild, the Alaska Gasline Inducement Act began the process of morphing a 30-year-old pipe-dream into a real pipeline to be completed by 2019. Governor Palin did not just say nice words about energy independence. Her actions made AGIA arguably the pinnacle of her gubernatorial career and will likely result in an accomplishment beyond the scale and scope achieved even by presidents. 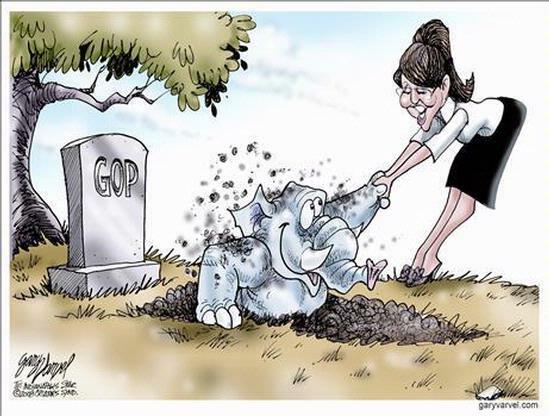 Some fourteen months have passed since Governor Palin was summoned and passed her Time of Choosing. Using nothing more than a laptop and FaceBook, she changed legislation and altered political discourse. She authored a book, had a major book tour, is nearly finished with a second book, does commentary on Fox News, is doing a documentary series on The Learning Channel, traveling on an international speaking circuit, and has endorsed and/or stumped for over 40 candidates with a success record greater than 60%. That history is simultaneously repeating itself and being made could not be clearer…. Two years ago today, Governor Sarah Palin delivered a speech that was praised by both Democrats and Republicans as a definite A+. Her time on that stage at the RNC Convention changed the face of the 2008 election campaign, even more than her successful Dayton, Ohio coming out party a few days prior. Here is an excellent article by Dr. Gina Loudon posted at Breitbart’s Big Journalism today (h/tp PalinTV). Dr. Loudon’s first-hand account is consistent with those of other Palin supporters who have met the Governor and spent time with her. Remember Vanity Fair (you know–the stale, old magazine that no one buys unless they are on the cover or they are wishing they were, like Joy Behar)? The recent hit piece on Sarah Palin by Michael Joseph Gross reveals that they must be as desperate as the rest of the MSM for sales/ratings, because they have lost all credibility, if they ever had any. I have read a lot of MSM slime over the years, but never, ever have I felt subjected to a more jealous, petty, sophomoric, disturbed piece of ragslime than I do after reading this latest on Sarah Palin. Gross left nothing alone. He attacked her beauty, intelligence, marriage, parents, friends, family, children, ability, sincerity, honesty, faith, state, husband, home, shoes, speeches, pastor, book, job, cooking, hunting skills, supporters, church, weight, undergarments… the list goes on. I honestly cannot think of anything about her that he did not attack. Unfortunately for Mr. Gross, it happens that I shared the stage with Sarah Palin at that event. I announced my BUYcott of Arizona that day, and I remember it well. As I stood backstage with the Palins I remember a reporter asking me if I were “Trig’s Nanny” with a hint of something I didn’t trust in his eyes. I coldly retorted, “no, I am Samuel’s mother.” He looked confused, and had more questions to follow. In his VF story, he said that no one is willing to speak about Sarah “on the record” unless they are paid by her, or afraid. I was one of the people you interviewed Mr. Gross. I am not paid, or afraid. But since you opted not to print what I told you, here is the rest of the story:Since the first time the Governor saw my son Samuel (who also has Down syndrome), she bolts across the room to greet him every time she sees him. She nuzzles him like a mother who loves children with Down syndrome does. I remember commenting to my husband that she always “does the mama smell” of Samuel, that only moms understand. All of the Palin children circle around Samuel the moment they can get close, but Piper, in particular, cannot seem to get enough of him. She literally plays with him (Gross does say she played with “the children” in his story) from the moment she sees him, until the moment she is pressed to let go of him. It is so sweet, and it speaks to the parenting in her life. She has obviously been taught a real, tangible love for “special children” by her parents, and it shines when she lights up at the sight of a baby with Down syndrome. This is not an ordinary reaction in children. Most children step away, look curious, or frightened, or confused. Not the Palin children, and especially not little Piper. After an event in Nashville, the Governor went to the trouble of making a special call to me to thank me and tell me how much Piper enjoyed “loving on” my Samuel. During the event where the Governor and I spoke in Independence, the Palins stood backstage for a long while as others took the stage. Sarah pulled me aside to ask me how blessed I felt to be the mother of someone chosen and special, like Samuel. She held both of my hands and confided her fears and love for her little Trig, and the miracle of all he has taught her. She glowed as she explained how he greets each morning with a smile, and we talked about the gentle touch of a child with Down syndrome that feels almost like the wing of an angel. I would love to tell you more about the depth of her love, concern, and compassion for her child, but she deserves my confidence. She spoke from a tender, mother’s heart, one that Mr. Gross wouldn’t know if it slapped him with a silicon spatula in a moose stew pot! After I explained which children were Todd and Sarah’s, and which were mine and my husband’s, Mr. Gross moved into a sinister line of questioning. I let him know that I was surprised that he believed the baloney written about her during her 2008 race with John McCain. I told of my work on Governor Palin’s “advance team” and that I was there when the whole St. Louis “story” about her alleged expensive taste became more important to some writers than her stellar performance in the debate. I told him the Governor I know was always polite, always a lady, even behind the scenes in her darkest moments. I remember one night after a day of campaign season attacks when she came back to the hotel afterward. She held Trig in one arm, and cuddled Piper with the other. She was patient with her other children when they were asking about exploring the hotel. She kissed her husband who, though tired, glowed with pride in his bride (he spent hours earlier in the day hanging out and smal -talking with the advance team while her plane was running behind schedule), and she was careful to stop and say hello to all her staff and advance team despite the fact that she must have been exhausted after battling the press all day. I remember that night because I could not understand where she was getting all her energy, joy, and warmth after such a wicked day. I told Mr. Gross that the Palin family is so real, it is unreal. What you saw in front of the cameras is precisely what you saw behind the scenes. I have known a lot of politicians. The interesting thing about the Palins is how grounded they are, despite their astonishing success. Mr. Gross says he talked to her hairdressers, makeup artists, waiters, and clerks at the Independence, Mo., event, and he tells of scandal, self absorption, and power slinging.But he never mentions talking to me, or to others I heard echoing the sentiments I offered to him. One of the most endearing components of the Palin family is their ability to point out, and laugh at their flaws. The Palins were gracious enough to let Mr. Gross follow them for months backstage, behind the scenes, and in their private moments around their staff and friends and family, and this is how he thanks them? Here is petty, but further evidence of Mr. Gross’ slander. Sarah is a size 4. She is tiny. So when you try to hit the woman in the place that would really hurt, and accuse her of spending $3,000 of campaign money on her underwear, namely Spanx girdles, it tells your readers so much about you. Oprah doesn’t spend that on her Spanx, and if she did, you wouldn’t write about it, because she is a liberal. That’s the poorly veiled truth about you, Mr. Gross, you are jealous of Sarah (it glares through your non-story) and you hate her because she stands for good, conservative values. And she has great shoes! The playground politics is not new to the political world, but this article employs the “takes one to know one” bully tactic to a whole new level. I do agree with you on one thing, Mr. Gross. You said that “Her talk of leading with ‘a servant’s heart’ is a dog-whistle for the born-again. Her dig at health-care reform as an expression of Democratic ambitions to “build a Utopia in the United States is practically a trumpet call (because the Kingdom of God is not of this earth), and perfection can be achieved only in the life to come. But it is Palin’s persistent encouragement of the prayer warriors that most clearly reveals her worldview: she is good, her opponents are evil, and the war is on.” Agreed. She is good, her opponents are evil, and the war is on! One more thing among your errors: “the boy” in the excerpted quote above, was not Trig Palin. That was my Samuel, also a beautiful boy with Down syndrome. No “nanny whisk(ed) the boy away.” I am his mother. I took my son, Samuel from Sarah before she went on stage. I told Mr. Gross that fact, but he didn’t let that divert him from his pathetic narrative. That is not journalism. That is just gross.